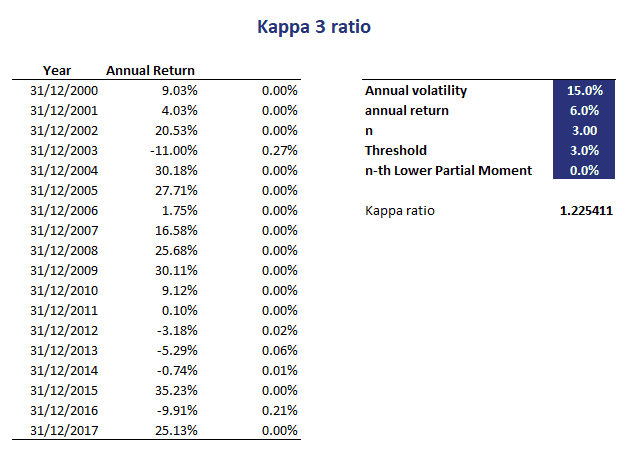 The Kappa ratio (KR), more commonly referred to as the Kappa 3 ratio, is a measure of risk-adjusted performance that considers downside risk. The Kappa measure was introduced by Kaplan and Knowles in 2004. The ratio is mainly used to rank investments in terms of attractiveness. 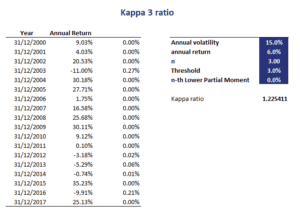 The advantage of the Kappa ratio, which the Kappa 3 ratio shares with the Omega ratio and Sortino ratio, is that the ratios do not assume returns are normally distributed. This is different from the Sharpe ratio, which assume returns are normally distributed. Here, we provide the Kappa ratio definition, discuss the interpretation of the Kappa 3 ratio, and finally provide an example in Excel that implements the calculation. We also discuss how both the Omega ratio and Sortino ratio can be derived from the Kappa. Where mu is the mean return, tau is the threshold return, and LPMn is the n-th order Lower Partial Moment. When we set the parameter j to 1, we get the Omega ratio – 1. So, adding 1 we get the Omega ratio. When we set j to 2, we get the Sortino ratio. In other words, the Kappa ratio unifies the Sortino and Omega ratio. The most commonly used value for j is 3. This explain why the ratio is generally referred to as the Kappa 3 ratio. Next, let’s consider a simple example to illustrate the calculation of the Kappa ratio in Excel. The following figure shows what the calculations look like. To calculate the ratio, we first need to be able to calculate the Lower Partial Moments. We discuss the calculation of Lower Partial Moments on this page. The Kappa 3 ratio spreadsheet calculator itself, which implements the kappa ratio example, can be downloaded at the bottom of the page. We discussed the Kappa measure, a measure of risk-adjusted performance which relies on downside risk. In particular, the kappa makes use of Lower Partial Moments as the measure or risk, instead of the more commonly used measure of risk standard deviation.